Investing in water is not an easy task. The stock universe is limited and liquidity is an issue also. The public equity funds we looked at by and large invest in the same stocks. The bigger the fund, the more likely the fund is to deviate from a ‘pure play’. Some funds invest in GE as a water play which may be dubious. 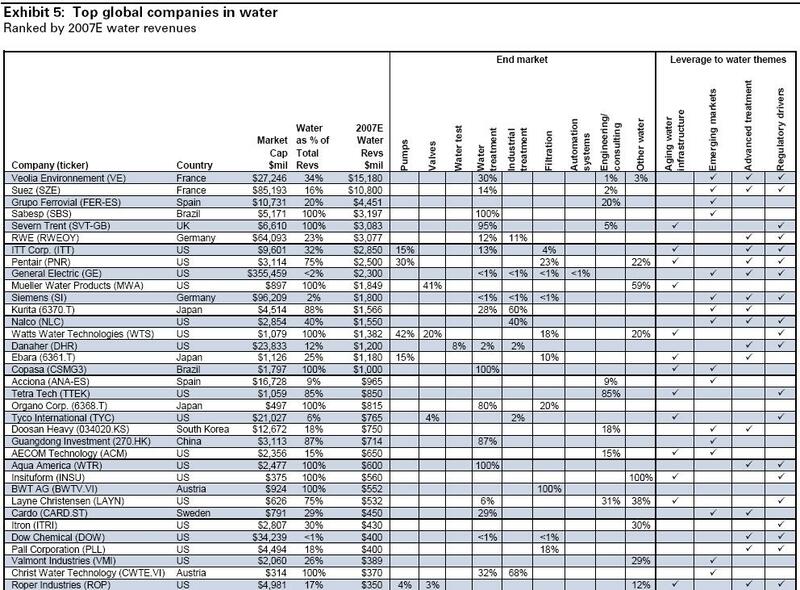 To defend the funds that do, Goldman Sachs’ primer on water identified that although GE only generates a small % of revenues from water (<2%), in absolute terms ($2.3bn, 2007E) GE does generate significantly more sales than many of its pure play counterparts. We wrote about this previously and also elaborated in this water piece by Matthew. “By 2025 over 40% of the world population could be living in water-scarce regions” (UNEP, ‘Challenges of Water Scarcity’). It becomes more and more apparent that as investors, a significant part of due diligence needs to be devoted to the aspect of water. It plays a critical role in the manufacturing process. Historically economies that had access to water have prospered and that is unlikely to change. It is imperative therefore that an assessment of firms sustainability planning takes water and water rights into consideration. Anecdotally, a glass manufacturer in China once mentioned to us that they had to drill 12m down to get access to groundwater. That is up from 4m the previous year. The information was not disclosed in any corporate material but came to light during a visit of the manufacturing facilities. The implications are enormous. The water sector has been chronically underinvested for decades. Simply put the incentive structure simply was not there (see ‘The economics of water‘). According to Brennan Investment Partners “[t]he US has an estimated backlog of between $300 billion – $1 trillion in water infrastructure replacement and upgrade requirements that should drive an annual rate of 6% – 8% spending growth”. The challenge for investors is to identify the right play: via public market equities, debt, venture capital and technology investments? The alternative: to pass and simply let public (or quasi) deal with the infrastructure element or engage via Public Private Partnerships. Until the subsidies for water are reduced, it makes for a difficult investment thesis. Fact is, water is an input factor to many industries. Reducing the subsidy on the price of water will make the cost curve for some firms relatively less attractive. Kinetics launched a fund that focuses on Water Infrastructure Investing (see below ‘The Funds’). The link between CO2/MH4 and water is important. It comes to no-one’s surprise that agriculture contributes significantly to the increase in CO2 and GHG. Methane is 21x as potent as CO2 and with the demand for more protein comes higher methane output – a dangerous and vicious circle. If earth temperature rises as predicted so will the demand for water to achieve the same yield. We wrote a separate piece on Water and the Food Chain – Crop per drop. We looked at a number of water ETFs and funds. Dickerson’s Summit is certainly one that has been around for some time. John Dickerson is a little apocalyptic. However we recommend his water investing primer. 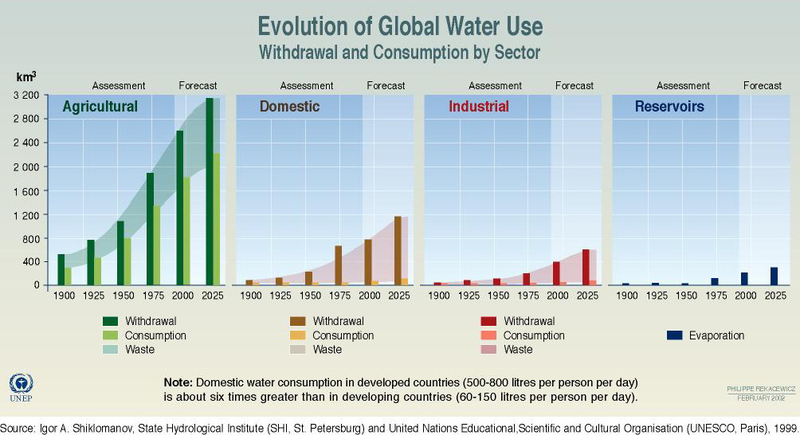 His most recent paper makes a case for water investing in 2010. A newer firm, Brennan Investment Partners LLC, has launched a Water Infrastructure Fund in 2007 and as of Dec 31, 2009 has about $23m assets under management (AuM). Brennan wrote an investment primer that should make for a good read. His February 2010 conference call note can be found here. The fund size is relatively small still. As per December 31, 2009 Top 10 holdings include URS Corp, Ameron International, Geberit, Lindsay Corp, Armtec Infrastructure, Veolia Environment, Northwest Pipe, Guangdong Invest, Tetra Tech, Itron. Brennan Investment Partners is closely linked to Kinectics (Mr Brennan runs both funds). Kinetics, aside from the Mutual fund, runs the Water Infrastructure Fund. The presentation uses a UNEP chart that is informative albeit a little out of date (see on the left). Credit Agricole Funds Aqua Global has about $31m AuM. The press release stated that the fund would make investments in companies that derive at least 25% from water relative activities. In a narrow sense, we are not sure whether this is true for the current top 10 holdings. The holdings include Nalco, Cia Saneam Minas Gerais-Copasa, Pentair, Sabesp, Suez Environment, American Water Works, Torishima Pump, Geberit, Calgon Carbon, and ITT. The Aqua Resources Fund, managed by FourWinds Capital Management, appears more diversified with respect to regional merit. Have a look at their Q4/2009 Newsletter. It is a closed-end fund. CLSA launched a Water and Waste Management fund out of Singapore. A strong proposition. A more holistic piece on investing in Asia’s water sector was published by the Association for Sustainable & Responsible Investment in Asia. UPDATE1: KBC offers a Water Fund that currently has about €240m AuM (retail). Top 10 Holdings as per Jan 31, 2010 include Agilent Technologies, American Water Works, Pentair, Danaher, Flowserve, Kurita Water, Suez Environment, Toray Industries, Nitto Denko, and Millipore Corporation. The institutional KBCAM Eco Water fund has about €720m AuM. As per 31/12/2009 the portfolio owns about 50 stocks and has a PE of 17.2x with a P/B 2.2x. Average market cap of portfolio holdings is about $3bn. UPDATE2: Calvert’s Global Water Fund is managed by KBC’s team. In contrast, Pictets Water Fund has some $3.1bn in assets. Per January 2010, Top 10 holdings include Veolia Environment (5.4%), Suez Environment, American Water Works, Geberit, Kurita Water Industries, Sabesp, Severn Trent, United Utilities Group, Pennon Group and CEMIG (3%). Therefore, Pictet has about $170m invested in Veolia. There are other funds but across the universe, the funds appear to invest in the same stable of stocks. Given the concentration around the relatively small universe, it is somewhat difficult to decide which horse to back. Pictet, although with a broader mandate, certainly will have a marginal impact on the daily trading activity. If one is invested in one of the smaller funds, this may impact the NAV of the funds – both up and down.